While you discover something on the web that you want to view it later, put it in Pocket. It automatically syncs to your phone, tablet, or computer so you can view it any time, even without an internet connection. – Articles, videos, or pretty much anything you find online. 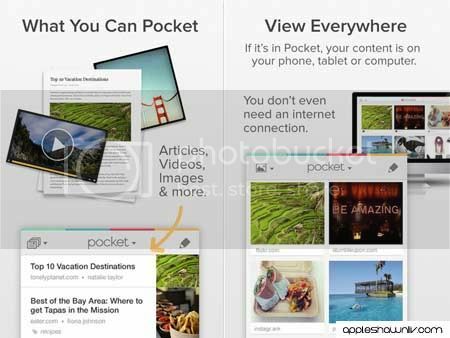 – If it’s in Pocket, it’s on your phone, tablet, and computer. – See your articles, videos, and everything else in a beautiful, easy-to-view layout. – Save directly from your browser or from over 300 different apps like Twitter, Flipboard, Pulse, and Zite.